Ans: Outer coat of the eye is white. Its transparent front part is called cornea. Ques: What is iris? Write the function of iris? Ans: Behind the cornea, we find a dark muscular structure called iris. (i) The iris controls the size of the pupil. (i) The outer most covering of eyes are white and hard. Ans: As it can prevent the inner most part of eyes by accidents. Ques: Differentiate between regular and diffused reflection. Does diffused reflection mean the failure of the laws of reflection? reflected rays are not parallel. It is due to regular and smooth surface. (i) A person 1 m in front of a plane mirror seems to be __1__________ m from his image. (i) If you touch your ____________ ear with right hand in front of a plane mirror it will be seen in the mirror that your right ear is touched with ____________ . (iii) The size of the pupil becomes ____________ when you see in dim light. (iv) Night birds have ____________ cones than rods in their eyes..
Q – Describe the construction of a kaleidoscope. Q – Draw a labeled sketch of the human eye. Q – Explain how you can take care of your eyes. Ques: What is blind spot? Ans: At the junction of the optic nerve and the retina, there are no sensory cells, so no vision is possible at that spot. This is called the blind spot. 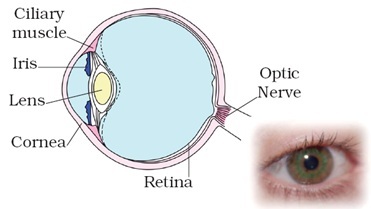 Ques: write kinds of optic nerves. (i) Cones, which are sensitive to bright light. (ii) Rods, which are sensitive to dim light.